Jonah ©2012 - One of the great things about working with photography is the unexpected cool twist that happens now and then. I took the base photo for this montage (minus the little boy) on an abandoned piece of property in Andover Township near the Newton border in New Jersey. It was one of the small buildings behind what used to be the St. Paul's Abbey retreat house, a notable landmark founded as a monastery in 1924 housing up to 60 monks. They led very simple lives using the surrounding property for beekeeping, cow raising, fruit growing and Christmas tree farming. After taking the image, I looked at it on my camera and thought my eyes were playing tricks. 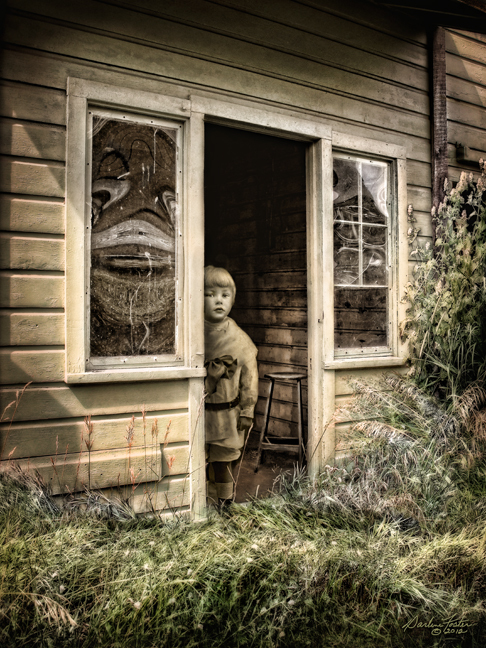 There were some wonderful reflections in the old window glass but one clearly looked like the face of a giant fish! To be sure it wasn't just me, I showed it to the person with me and the first thing he said was "Hey! There's a fish face in the window!". I added the boy from my vintage photo collection, a little more plant life from around the property and some toning and selected filters to complete (what I thought to be an appropriate title) "Jonah".